"N Korea's Kim died in 2003; replaced by lookalike, says Waseda professor"
So perhaps Kim Jong-il, the most diabolical, beloved, and cutest dictator today, has been dead for five years and counting. Who doesn't hope this is true? This would be amazing. The only thing more amazing would be to find out that Busta Rhymes has been dead and was replaced by a lookalike that started making Mountain Dew commercials. And when you think about what that implies, he sort of has. I mean sure, he shows impressive vitality now and then. But Kim Jong-il surely stirs in his grave, too. This is a great strategy to prolong the reign of any dictatorship. Future dictators, take note! 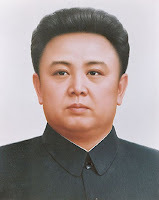 Also: if Kim Jong-il is dead, who the hell is controlling North Korea? Also In North Korea: They Might Be Eating Rabbits The Size of 9-Year Olds. See Pic Below. Sure, one can speculate wildly about whether or not N. Korea is being run by a phantom dictator...but this story is not speculation. This is fact. 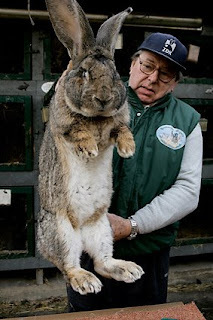 This man was approached by North Korea about the possibility of using his giant rabbits as a food source for the North Korean people. I'm not sure how this ties in with North Korea's nuclear tests, but somehow it seems to fit perfectly. They're eating giant rabbits in one of the saddest nations on earth. This surely qualifies as Real Talk. # Posted at 10:23 PM. i am reading this from seoul, less than half an hour's drive away from mutant rabbits apparently.